Many years ago, when Delhi’s air pollution was as high as it is today, my colleague Anil Agarwal and I had gone to meet a high-ranking, responsible government official. This was in the mid-1990s, when air was black because we did not even have the most rudimentary fuel quality and emission controls. The official was genuinely stumped by our demand that government should take steps to control runaway pollution. He kept asking, “But is Delhi really polluted?” I was equally flummoxed; air was foul and black. How could he miss it? Then I realised that his world was not mine to see. He travelled from his home, located in luxuriantly green Lutyens’ Delhi—also known as the New Delhi Municipal Council (NDMC), where government resides—to his office, also in the same verdant surroundings. Nowhere did he see any dirt; nowhere did he smell the air. And as it was not seen, it could not exist, so nothing needed to be done. This incident came to my mind when I read that the Government of India had decided to select New Delhi—Lutyens’ Delhi—for the smart city makeover. Under this scheme, 20 cities have been selected based on “rigorous” criteria to improve urban living. The Government of India will now provide funds and expertise to make the city “smart”—defined as innovative approaches to improvement in urban services. This means that the government will spend on facilities to make its own living area even better and more removed from the squalor, poverty and pollution of the rest of India. The announcement declaring New Delhi Municipal Council a winner of the smart city challenge came when the rest of Delhi was drowning in urban waste. Municipal workers had declared a strike alleging non-payment of their dues. The contrast between where the government lives and where the rest of the citizens live could not have been more evident and striking. The fact that the government was now investing even more to make its own world better is a damning indictment of its non-inclusive approach to urban India. Just think. This is India’s gated community of elite access. Of the total land area of Delhi, Lutyens’ city—named after the British urban planner and constructed to reflect the grandeur of the colonial state—is only three per cent. The Government of India owns over 80 per cent of the land, including the buildings in the Lutyens zone. No democracy is at work here. The NDMC is a council and not a corporation, so it is headed not by an elected representative but by a bureaucrat. 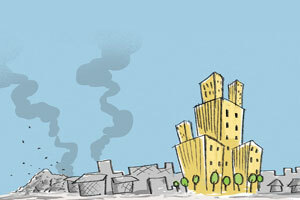 It is also a parasite of a city; it has the highest water footprint as compared to any other part of India. Its daily per capita water supply is 462 litres, while in other parts of the same city people get below 30 litres. Even as per government’s own norms, which specify highest water supply as 150 litres per capita per day, this is excessive, indeed gluttonous and wasteful. This water inequity is shameful and should have, in fact, disqualified Lutyens’ Delhi from any smart city challenge in my view. It is also highly land-extravagant. While the city of Delhi has been imploding with a decadal growth rate of almost 50 per cent, the NDMC area is so privileged that it has a negative decadal growth rate of 2 per cent, according to its own sub-zonal plan. In other words, people are not welcome in this gated city. In this city of India, over 30 per cent of the land is under recreational purposes. This is so out of sync with the rest of the city and indeed the rest of India that is fighting for its inches of green spaces. But even with all this land, the gated city of NDMC does not manage its own waste. This is sent to the rest of Delhi’s landfills. Its land is too precious for its waste. It does a lot of “cute” stuff like segregation of waste and even involves rag pickers in collecting waste from households. But the bulk of its waste goes to Okhla, where the compost plant is dysfunctional, and the rest to Delhi’s overflowing Ghazipur landfill. This is when it has no shortage of funds as government spends on itself without any questions. New Delhi is not a smart city for all these reasons. It is certainly not a city that can be replicated in the rest of India. It is resource-inefficient, highly iniquitous and highly environmentally unprincipled. This is not what smart cities should stand for. Former New York mayor and billionaire Michael Bloomberg’s foundation, Bloomberg Philanthropies, is government’s knowledge partner for the Smart Cities Initiative. This initiative will define what smart cities will mean for India and what we must aspire to. It is important for this reason alone that they must choose wisely. 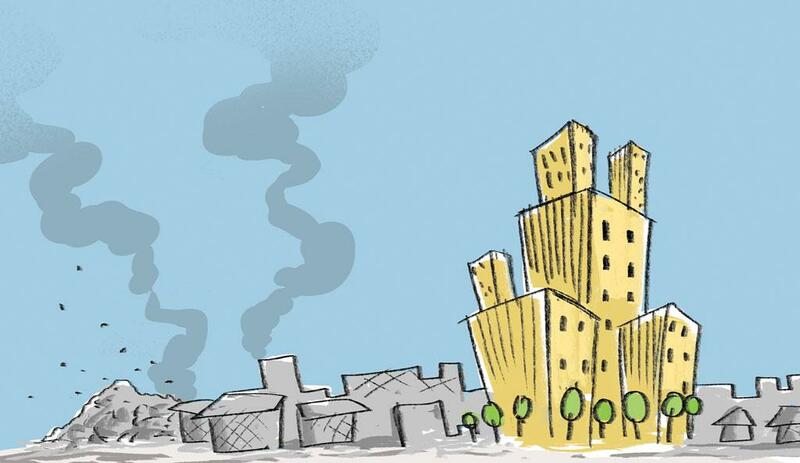 The symbols of India’s urban renewal cannot be cities for the elite and by the elite. This is not smart—not by a long shot. How I wish Nehru had razed to ground the Lutyens' Delhi what he thought the British had left behind the 'awful colonial symbol'! Over the decades of Congress rule that had gradually turned into started acquiring the 'aura' of old 'Delhi Durbar'.Ideally it is best to bulldoze and raze the elite housing part of LD to ground and merge it with rest of the city. At best some flats can be built but majority of the MPs and ministers can stay and operate from spread all over Delhi like other people availing facilities for health, schooling etc. with rest of Delhites. Why segregation of the rulers from the ruled of past colonial era needed anymore? That will also help improve working of these facilities. When Modi took office he was considered an 'outsider' people wondering how well he would fit in it! But going by the style of his functioning he appears to have taken to it like duck taking to water the way protests have erupted due to center’s interference among young university students on the matter of freedom of speech, dissentions, debate etc. !In fact he seems to have outdone his congress predecessors going by the change of expensive clothing every day he wears making even the aristocratic Nehru fade in comparison! No wonder with this ‘nawabi’ Modi in command 'Lutyens' delhi is selected among smart cities in the first list. Of course there will be contestable criteria and political bias in selection of smart cities. But the idea of "Smart City" in a country like ours is pugnacious. With thousands of cities / towns drowning in garbage and filth (including all of non NDMC New Delhi), with power cuts and severely rationed water supply and un-breathable air, and corrupt councilors and contractors and central and state politicians unwilling to let go (of the booty), it is downright absurd that we are even talking about something as ludicrous as Smart cities! The issue is that no matter what or how much the government is willing to invest in "smart cities", are we politically mature enough to let Local Urban Bodies and Urban Governments work with a free hand? The case of the so called state of Delhi, where the Government of India is unable (cannot afford?) to let the elected Delhi Government work, is salient. The question that nobody is willing to answer then, is: Who is the Boss, in Delhi or any other city? What is the 'idea' of being PM of India if an upstart like Khejriwal is allowed to run Delhi? Or what is great of being the CM of a state if one has no say in allotting contracts or quota to give away prime plots to Baba Ramdev? Yes you are very right, the unreal world around us shuts the minds of the planners & administrators, they hardly try to see beyond their green patches. Let us hope the concept of smart cities would expand out from the periphery to other parts of urban India as well. My be its a small step towards awakening and a better future. Why is everyone silent on the need to implement the 73rd and 74th Constitutional amendments? If we could do that, all of India - except Delhi! - would be half way to the right kind of smartness!